Jan Marini Lash is an eyelash conditioner that works to increase hair length and growth to create thicker, fuller lashes. Available in a mascara-like tube with an eyeliner brush applicator, the Jan Marini product uses a non-prostaglandin formula that contains a revolutionary proprietary peptide that enhances lash growth. 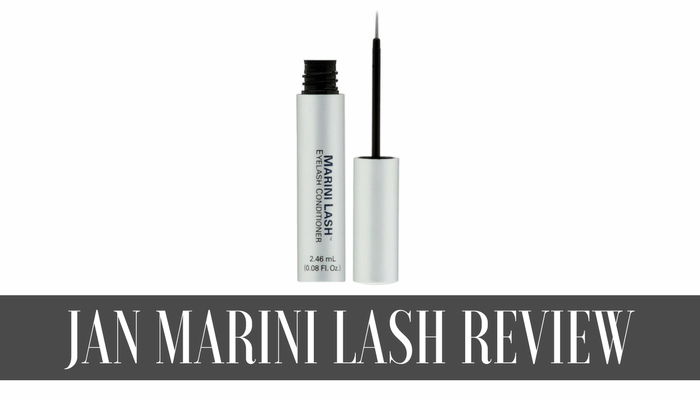 Lasting around six months, each tube of Marini Lash costs around $150.00 and repairs existing lashes while encouraging growth in sparse areas. How does Jan Marini Lash work? Whether you are born with short, sparse eye lashes or have damaged them with mascara or other products, it`s unlikely that they will grow fuller or longer on their own. Unlike other lash enhancers, Marini Lash does not contain prostaglandins, but is a combination of different moisturizers (sodium hyaluronate and hydrolyzed glycosaminoglycans), preservatives, synthetic peptides, pentapeptide-17, fatty acids, biotin and other natural ingredients that encourage hair growth like cinnamon, horse chestnut and white tea. When combined, each of these ingredients targets a different aspect of hair repair and growth. In particular, the conditioners and fatty acids work to mend dry, brittle lashes while the biotin and other ingredients combine to stimulate the growth of both new and longer lashes. Our Research on Jan Marini Lash Suggests: Our online research of Marini Lash showed mixed results. Many consumers who used the original Jan Marini lash growth product (which was taken off the market because of an ingredient recall) were disappointed with the new Marini Lash in comparison. Though many people revealed that the product did cause their lashes to become less dry and grow longer, few found that it actually encouraged new lash growth and said that they did not notice that their eyelashes were thicker or fuller. Those who did see results said that they noticed their lashes were growing longer within about three weeks. Some people who used the product over a prolonged period of time (longer than a year) noticed that their lashes began to become dry and eventually fall out, so they stopped using it. Many people were also very disappointed with the price, which varies per retailer but generally ranges between $100 and $150. Results are noticeable within only a few weeks of use. The presence of conditioners and fatty acids allows dry, brittle lashes to become healthy again. Application is simple and mess-free. Is very expensive compared to other lash enhancement products. Can only be used on the eyelashes and not brows. Does not work as well as a popular previous Jan Marini lash growth product. Users find that new lash growth is sparse. Prolonged use may cause lashes to dry up and fall out. If it comes in contact with the eye, particularly one that is scratched or already irritated, Marini Lash can cause eye agitation. If the product causes eye irritation, rinse the eyes with cold water and visit a doctor if the agitation continues. Many users also found that prolonged use of the product caused their eyelashes to become dry and eventually fall out. After receiving mixed user reviews, Marini Lash may not be worth it is high price. Compared to previous Jan Marini lash enhancement products and other similar, less expensive products on the market, Marini Lash does not have impressive results. Though the product claims to result in fuller lashes, many people found that it only encouraged lashes to grow longer, not thicker. Though side effects were not universal, there were also many users who were disappointed when prolonged use caused their eyelashes to dry up and fall out, defeating the entire purpose of using such a product. 0 stars. Have been using nightly, following the instructions exactly, for 6 months. Product has not lengthened or thickened my lashes at all. Save your money. Was expecting it to have a somewhat similar effect as her original product which was yanked from the shelves by the FDA, but didn’t see any effect at all. It does burn if I got into my eye, but that wasn’t the effect I was hoping to see. I have used and liked other Jan Marini face products, but not this lash conditioner. Very disappointed. I used MD Lash for years with good reults. I moved to Marini Lash at the beginning of the year. It took a few months before I noticed a change to the length of my lshes. In fact it seemed as though they shrank, & I even experienced fallout. I was informed that by changing the stimuli to the receptor point in the lash could cause a delyayed reaction in growth. Almost like using a scheduled drug & then moving to a homeopathic solution. The homeopathic medication will work but it takes time for the body to adjust from serious scheduled medictaion. I decided to carry on & I am pleased to say at four months I started to see the growth finally starting again. It’s been six months now & my lashes have never looked as good ! longer than ever even thicker than before. In fact my family, friends & collegues constantly comment & believe they look even more incredible than when on the previous product MD Lash ! I can highly recomend the Marini Lash to anyone who wants longer, fuller lashes safely !